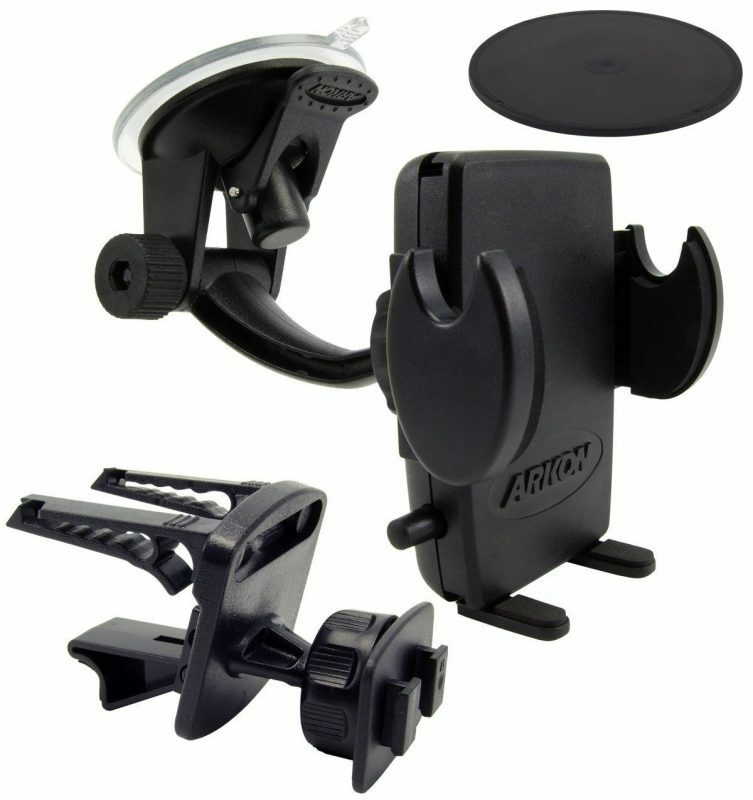 The Arkon SM410 Car Smartphone Mount Kit has been around for a long time. The kit was introduced before everyone had a smartphone in their pocket. It’s still as useful today as it was when I first starting using it. The car mount kit is one of the more diverse offered on the market for smartphones. The primary advantage of this kit is the ability to mount it on the windshield, dashboard or air vent of your car. This kit has everything needed to attach your phone to all these locations. There are four parts contained within the kit: Mega Grip cradle, suction cup mount, adhesive dash disk and air vent mount. All mounts allow your phone to swivel into landscape or portrait and can be pivoted towards the driver or passenger. Your smartphone will be held by the Mega Grip cradle. This cradle fits smartphones 2.25 inches to 3.25 inches wide. The cradle opens by pressing the button on the side of the cradle. It closes by simply pressing the arms tightly against the phone. There are two support legs which can be moved from side to side to accommodate any ports on the bottom of the phone, or can be removed altogether (which I don’t recommend as it’s additional support for your phone). The back of the Mega Grip cradle has two slots which are used to attach to the mounts that are included. The Mega Grip cradle opens large enough for most phones with or without a case or skin. As a point of reference, this is large enough to fit an Apple iPhone 6 which is 2.64″ wide or Samsung Galaxy S6 which comes in at 2.79″. Adding a case or skin shouldn’t be an issue. The Mega Grip is going to be large enough for almost all smartphones. The suction cup mount is a well made adjustable mount. There is an adjustment point in the middle and the tip where the cradle attaches swivels 360 degrees. The suction cup has a vacuum lock which is engaged by pressing the lever near the suction cup down. Always start with a clean windshield. An alcohol wipe is included within the mounting kit. Use it on the windshield before you apply the mount because a dirty windshield can effect any suction cup. The suction cup mount can attach to any smooth and flat surface. The windshield is a real popular place to mount a smartphone because it keeps it at eye level. Windshield mounting may not be legal in your state so be sure to read our article on this topic if not sure. This mounting kit includes an adhesive dash disk. This dash disk is smooth like your windshield. The suction cup can attach directly to the dash disk the same way it would on your windshield. The dash disk has an adhesive pad attached to the bottom. Be sure to wipe your dash clean of any oil or residue before attaching the adhesive. Let the adhesive disk sit unused for 24 hours after attaching it to your dashboard. This allows the adhesive to cure for the best hold. This is a great accessory for those states that do not allow attachment to your windshield. The mounting kit also includes a vent mount. We have been big proponents of vent mounts for a long time. The vent keeps the phone near eye level yet it’s out of plain site so bad guys can’t easily tell you have a car mount. Attachment of the vent mount is fairly easy and works best on vents where the slats are horizontal. The vent mount has two arms which slide over the slats and has a lower stabilizer bar to keep the mount stable allow the cradle to sit upwards more readily. The Arkon SM410 Car Smartphone Mount Kit should turn out to be a good long-term investment. Universal cradles are the way to go and the Mega Grip size should fit your future phone upgrades in addition to today’s phone. This means that when you upgrade your phone, a new mount may not need to be purchased.